Our imaginations regarding the Arab world have been bleached by images of dusty, wartorn cities, Central Asian wastelands and treeless stretches of mine-ladden no man's land. This periodical serves as a much needed dose of color for those of us who are weary of the drums of war. It is good to remember that the Middle East is the cradle of civilization, art, math, science, spices and even artists pigments. With the US media pummeling us with images of burkas, car bombs and Humvees for the past four years, it was refreshing to run across this publication with articles on Arab women writers, handpainted Pakistani trucks, and the history of gum arabic (Volume 56, Number 2 March/April 2005). Saudi Aramco World gives insight into the rich, complex and urbane artistic lives of the Muslim and Arab world which stretches from Indonesia through Africa, Asia, Europe and even the suburbs of North America. All across Pakistan, this rolling folk art has turned village lanes, city streets and long-distance highways into a national gallery without walls, a free-form, kaleidoscopic exhibition in perpetual motion. The vast majority of Pakistan’s trucks, buses and motorized rickshaws are riots of color, bedizened top to bottom with eye-popping landscapes, portraits, calligraphic poetry, religious verses and wisecracking expressions of star-spangled banter. Only the biggest, blandest container freight trucks, the 18-wheeler rigs, escape decoration, looking naked by comparison. An archive of free images from almost four decades of the publication are available on-line. For a rich, saturated record of an overland journey from Afghanistan to Vietnam, check out this beautiful book. From 1972 until 1979, Kevin Kelly was an independent photographer in remote parts of Asia, and roamed Japan, Korea, Taiwan, Philippines, Burma, Thailand, Bengladesh, India, Sri Lanka, Nepal, Pakistan, Afghanistan, and Iran. 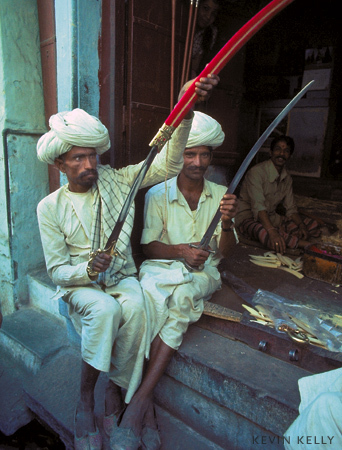 RIGHT: RAJASTAN, INDIA--Rajastanis inspect ceremonial swords. India's desert warriors, much influenced by the Moguls, still breed and ride camels, and often still carry firearms. Taking the thousands of photographs he took during the 1970s, Kelly took his years of experience in journalism and became a one-man production house. The former editor of WIRED magazine handled all the scanning, photo retouching, color proofing, layout, design, sales, and promotion for the book. He even flew to Italy to oversee the printing process. Taschen picked up the book after Kelly drove down to the publisher's house in California and showed him the ink jet proofs in person. No agent. No design team. No meddling!